One has to visit Sri Kambahareswara Sarabeswara Temple, Tirubhuvanam located near Kumbakonam Tamilnadu. 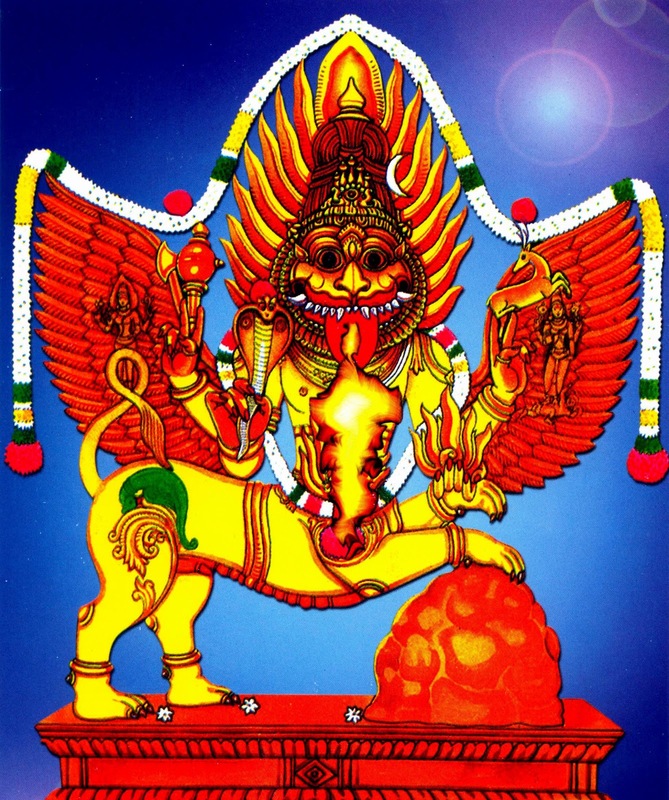 There is a separate shrine for Sarabeswarar, a fusion of man, eagle and lion - the deity is believed to have relieved the devas (celestial deities) from the furty of Vishnu in the form of Narasimha after he slayed Hiranyakasibu. You should be there on the day of Pradosha. Pradosham is a day which occurs once every 13 days. You can refer to Traditional Hindu calenders to know the pradosham day of the month and year. Easy way to find it is, 2 days before Ammavasya (no moon day) and 2 days before Full moon day will be Pradosham. A Pradosham falling on a Monday is called Soma Pradosh or Chandra Pradosh, on a Tuesday is known as Bhauma Pradosh, and on a Saturday is called Shani Pradosh. 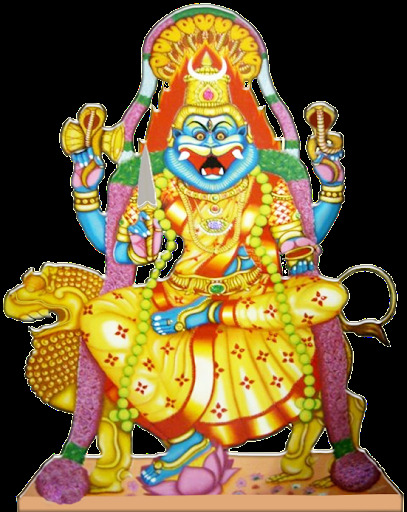 One has to offer lemon (Elumichai in Tamil ; Nimbe Hannu in Kannada) garland consisting of 18 lemons to Lord Sarabeshwara. You should offer Vibhuthi (Sacred Ash) Archana to Lord Sarabeshwara. You will get back 2 or 3 lemons as prasadam after offering the garland. You should also offer any Shashwatha (Permanence) seva or pooja available on the day of Pradosha which may cost Rs.501, 601 or 1001. For these type of seva's, the temple management will be sending prasadam directly to your home for every pradosha pooja done in the temple. After completing above all said procedures, one has to visit Sri Maha Prathyangira Devi Temple, situated in a small village called Ayyavadi around 6 kms from Kumbakonam Tamilnadu. She is worshipped in a temple in the middle of a graveyards. In this temple, you should offer Oleander (Kanagale in Kannada ; Alari in Tamil) flowers archana, Vermillion Powder (Kunkuma in Kannada ; Kunkumam in Tamil) archana and should offer Red colored blouse piece (ravike in Kannada & Tamil) to Goddess. You should offer lemon garland consisting of 32 lemons to Goddess Prathyangira Devi. Note that you should not collect any lemon as prasadha in this temple. You can only collect Kumkuma as prasadam. You will also get sacred ash as prasadam for the poojas offered in Amavasya days. You will bring back home the lemon given in Lord Sarabeshwara Temple and Kumkuma in Goddess Prathyangira Devi Temple. Prepare Panaka (Indian Lemonade) with the lemon and consume it has theertha and sprinkle it in all corners of your home for protection. If married, one has to visit the above temples with your husband/wife. Visiting the temple with whole family will yield better results. Is it Alari or Araali flowers? Sevvaraali (Red oleander) is usually offered for Durga/Pratyangira. Its Araali, Guruji didnt mention any colour for the flower. If Red is usually offered, offer the same.